Very charming cabin with Large Bedrooms and Living Area. Very well maintained, clean, and Renovated Throughout in 2001, including Appliances. Very comfortable and convenient to many scenic outdoor activities. Five minute walk to the lake. Full size washer and dryer. Gas Furnace and Wood Stove. Very large Back Deck with plenty of seating. Bedrooms are located upstairs - 2 Queen beds and 1 Twin. Downstairs is a Queen sleep sofa. Full bathroom is located downstairs. This property is 2 miles south of Homewood Ski Resort, and only 8 miles to Tahoe City. Near lots of great Hiking Trails, Beaches and 1 Block from Sugar Pine Point State Park with miles of hiking and cross country skiing. Just 2 miles from beautiful Meeks Bay, and close to Rubicon as well. Emerald Bay is about a 20 minute drive (9.5 miles). Very quiet neighborhood. Come get away from the rat race and enjoy all the beauty and serenity that Tahoe has to offer! This is a great value for a nice get-away. The West Shore is the Best Shore! Hello, and thank you for visiting our rental page! We are new to the cabin but it has been a vacation home since 2001. We try very hard to make it comfortable and relaxing for our guests and provide the items guests most care about. If you have any suggestions for improvement I like to hear them. I enjoy many of the activities that Tahoe has to offer year round, and whether you just want to get away and relax, or take in all that Tahoe has to offer, you will find my cabin and location will provide what you are looking for. Before purchasing our cabin, we rented several properties for weekend getaways in the Tahoma area. The area offers a great value, and provides so much more than renting a hotel room. It is also conveniently located, and just a 5 to 10 minute walk to the lake, where we have a dock and beach you my use. 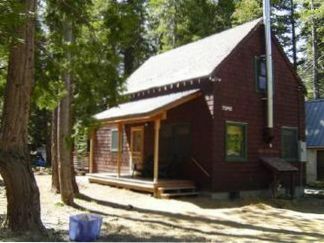 We are also one block from Sugar Pine Forest with miles of hiking and cross country skiing. The neighborhood is quiet and friendly and relaxed. We fell in love with my cabin instantly. The cabin is very cute and charming, and has a very nice layout. The cabin is close to many great hiking trails, a 5 minute walk to the beach, and near several very pretty beaches on the west shore. It is also right next to Sugar Pine State Park. Many ski resorts are within 15 - 20 minutes driving, and just 2 miles from Homewood Ski resort. There are several nice restaurants on the west shore, and just 8 miles to Tahoe City. The cabin has a front porch and a large back deck with lots of seating. There is also, during the summer months, a gas bar-b-que for guests use. The kitchen is well supplied, and linens and towels are provided. There is a wood stove and a gas furnace which heats up the place quickly. Internet service and cable TV are also provided. No land line phone is provided. Table has built in leaves so arrangements are from 4 to 8 depending on the configuration you need for dinning. Loved our weekend getaway. This cozy cabin made our stay so nice. Beds are comfortable. Would stay again. super close to homewood. Nice and beautiful place, I really enjoyed this beautiful cabin, thank you. Cabin is small but cozy. Everyone was comfortable. All had a good time. Instructions were clear and communication with owner was good. Would stay again. The cabin was exactly as it was advertised. Very warm, comfortable and pleasant. Especially as it was snow while we were there.